I love when something so healthy is so delicious AND the kids love it. This is a perfect pick me up for any day. Filled with protein, has quinoa, and gone in one bite! Perfect. And you don’t have to cook the quinoa! The more I brag about this recipe the more it seems like magic. So easy! Here’s the half hour recipe, including the 20 minutes of bake time. Preheat oven to 350 degrees F. Grease the muffin tin. Make sure you use an ample amount of grease for two reasons; you’ll want the quiches to come out easily, and you want the quinoa crust to stick. Spoon about half a tsp of quinoa into each muffin cup. You’ll want the cups to be as covered as possible, so give the muffin tin a little shake to spread them out evenly. Mix the rest of the ingredients into a bowl. Give them a good mix so they are well incorporated, including the eggs. 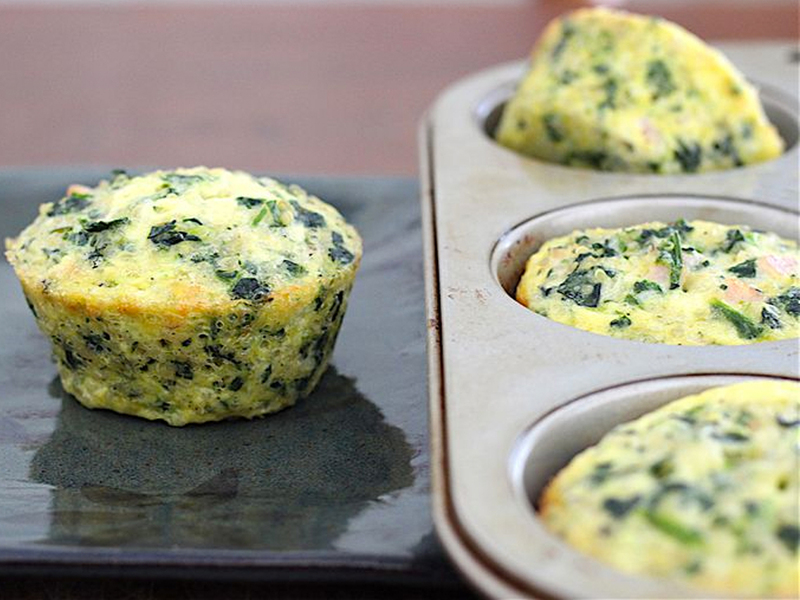 Pour the egg mixture into prepared muffin tins and you’re done! Put them in the oven and bake for about 20 minutes, or until they start looking puffy and delicious; golden brown colour. Allow to cool, but still serve warm. Enjoy!